support you through this challenge. While Galen was not a direct product of NaNoWriMo, I believe that my participation in this challenge redefined my writing and what I believe about writing. 2007. By this time, I had already put Galen into hibernation for the past year, even though it was only half-finished. I was skeptical about the NaNoWriMo challenge and had heard about how it drives people crazy, destroying all hope of coherent plot, and leaving participants with rough, raw babblings that are hardly recognizable as a novel. I know, after hearing such wonderful things, why would anyone want to try this? Well, the answer is that those who were driven crazy by it also loved it and swore by the effectiveness of finishing first draft novels. Since I was stuck in my own rut of a half complete first draft novel myself, I was curious to see if the NaNoWriMo challenge could actually produce a full novel in a month. I had nothing to lose but time, and I made sure that I had nothing to lose by refusing to write an original story of my own, just in case I ended up ruining something great. So I participated in the challenge for the first time by writing my first piece of fanfiction; why make my ideas suffer when I could test it out on someone else’s? I also dragged a writer friend of mine into the challenge too, and she was equally intrigued by it. Well we began at midnight and that was the end of a normal life as I knew it. It is amazing how much time you can find in a day when you really need it. I didn’t sacrifice anything. I went to all of my classes, did all of my readings, and even kept up all of my volunteer responsibilities. 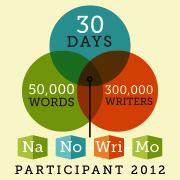 It was draining, and I understood all too well why participants claimed that NaNoWriMo destroys your soul for a month. I was driven crazy. The novel was all that I thought about, that and finding time to write it. My plot was derailed, things happened that I never planned, characters took over and rode out the story the way that they wanted it to. And yes, by the end, I had so many inconsistencies, started and stopped scenes that were abandoned and rewritten just below in case I changed by mind on the direction (it is a general rule that a WriMo never erases anything; that’s what December editing is for). 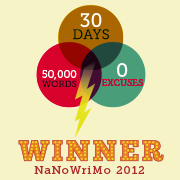 Everything that I had heard about NaNoWriMo was true, and I loved it. 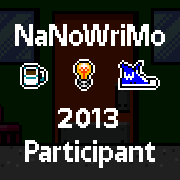 I have participated in NaNoWriMo every year since, though I question it every year, wondering if I’ll even have time for it. Just last year I convinced myself that I was so busy that it would be alright if I didn’t win the challenge. But NaNoWriMo is fueled by subborness and I had to keep going. NaNoWriMo gets me going in November, but I have a whole new energy to continue writing and editing the rest of the year. I know that I am capable of getting through my stories, that I do have time for them, and that writer’s block is never reason to give up on your story. It isn’t up to the writer to produce the story anyway, a writer just has to listen. The story knows what it is. The characters know what they’re doing. As the writer, I am only the vessel that translates that story into the squiggly symbols we call words. Well, November is coming up again, and I will participate. Also, for the whole of my undergrad I have not reciprocated my appreciation for the free accessible community that NaNoWriMo is. I may still be a student on a student budget, but Galen’s publication would not have been possible without NaNoWriMo. After all, it was through winning my first NaNo challenge that I was introduced to CreateSpace who walked me through self-publishing. Galen has entered the world and has begun to sell. I never believed in writing for the money, I do it for the love of it, for the need of telling a story that wants to be told, and I intend on holding to that as long as I do write. I have almost accumulated $5o in sales. When that amount is reached, I will give it as a long overdue donation to the Office of Lights and Letters. $10 for every year that I participated, and the extra$10 as a thanks for all that they do. It is wonderful to know that they understand not everyone is able to give and yet they do not deny anyone the amazing resources they provide. For all that they do, I cannot thank them enough, but hopefully this is a good start. Not just the donation, but being a success story and letting all aspiring writers know that the people at NaNoWriMo can get you where your stories need to go too. Support your writing and support your fellow writers.